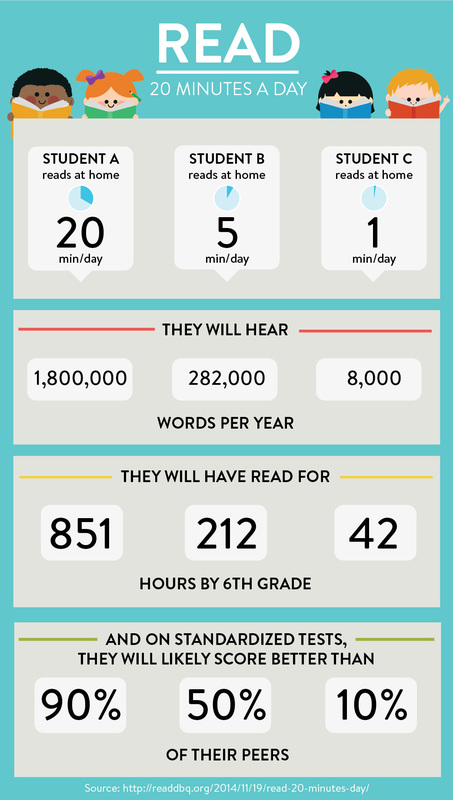 Starting in kindergarten, if a student reads 20 minutes a day at home, they will hear 1.8 million words per year. They will have read for 851 hours by 6th grade and on standardized tests, they will likely score better than 90% of their peers. This is compelling data on the benefits of encouraging your child to read. From the time your child is born, reading out loud is a positive influence. As your child grows, daily reading will help the brain make connections between the written and spoken word, widening vocabulary in the process. Adding to that benefit, vocabulary knowledge equates to masterful spelling. In fact, reading, spelling and vocabulary are critically important to a child's lifelong achievement. Reading is more than just translating written words into verbal form; it is about understanding those words were once ideas in the minds of great thinkers. It is about realizing those ideas can be connected to personal experiences. Through daily reading, children are exposed to a world outside their own reality. It expands their know-how, opens their minds and creates the potential for a continuation of ideas and an endless number of possibilities. There is nothing quite like reading together as a family. Whether you're flipping through picture books with your little ones or sitting in the same room with older kids while, each immersed in a piece of literature, these are times you remember. For a moment, you are all able to escape worries and experience art in written form. It is something that can be recreated in different forms with every new book and family read-a-thon. Whether it’s a picture book, a novel or even help resources , there are many options. With technology, particularly tablets like Kindle, your child has access to thousands of books anytime, anywhere. Reading on a Kindle ensures children are never without a new title and, based on their interests, they can easily find recommended books. Additionally, children can take advantage of a Kindle to improve reading skills through the development of word fluency and comprehension. Word Wise , for example, places short and simple definitions and synonyms directly above difficult words in text, so kids can better understand the material and keep reading with few interruptions. Vocabulary Builder automatically takes words users look up and creates flashcards with definitions and word usage examples. So, in honor of National Reading Month, this is a great time to encourage your child to dive into a great new book and get the whole family reading each day too.